Around Town: Dunbar Ryerson, Refugee Guide, Reformation, Heritage Hill . . .
Dunbar Ryerson United Church has made an application to redevelop its property. The current church building (on the left) would remain, but several new buildings would be added. 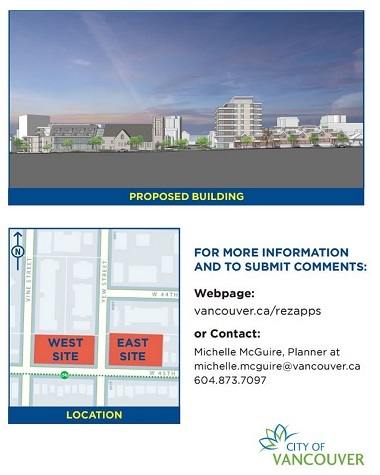 Dunbar Ryerson United Church recently announced plans to redevelop its Kerrisdale property – and there is already a Ryerson Neighbours website and campaign to block it. The church owns two parcels of land on the north side of 45th Avenue, on either side of Yew Street, just west of West Boulevard. The area is fairly quiet and residential, though it is close to the shopping district on 41st and there are a number of highrises in the area. Many will know the church as a regular host of concerts. No doubt the open house – which will take place next Monday (February 27), from 5 – 8 pm at Dunbar Ryerson’s Memorial Centre – will also be a full house. We live near Ryerson church, in a community just like other single family neighbourhoods. And change is happening. The main arterials (i.e. E and W Boulevard) have new apartment/commercial buildings (with 4 storey height restrictions) and we are adjusting to and welcoming many of the changes. Like other neighbourhoods, we reject spot up-zoning off main arterial routes, welcome the retention of corner stores which evolve into community coffee shops and enjoy the bike routes that weave together these oases of calm. We refuse re-zoning for an 8-storey-plus-penthouse tower to overshadow the church and the street where we bike. Please join us in rejecting re-zoning on W 45th Ave. The West 45th location will be extensively redeveloped starting sometime in the next two years. When the redevelopment is finished, the congregation will move permanently into the new church facility on 45th Avenue. Churches are in an awkward spot when it comes to redevelopment. The city is encouraging greater densification, but neighbours generally aren’t keen on the idea. The open house should provide a good opportunity for members of other churches to get a firsthand look at one such initiative. Kinbrace launched a resource for refugee claimants February 16, just in time to meet the needs of increasing numbers of refugee claimants arriving in Canada seeking refugee protection. Ready for My Refugee Hearing is designed to strengthen access to refugee protection for asylum seekers, making two national offers – the Refugee Hearing Preparation Guide and READY Tours – readily available. Asylum seekers arriving in Canada face huge challenges, including the risks of getting into the country and the work of finding safe shelter, a basic human need. Midst this quest for survival, refugee claimants must scramble to engage Canada’s inland refugee protection system – a complex legal bureaucracy designed to protect those who are refugees. The key moment for decision-making by the Immigration and Refugee Board of Canada – Refugee Protection Division happens at the refugee hearing, when the claimant tells their story with supporting documentation. Built on collaboration with non-government, government and intergovernmental agencies across the country, Ready for My Refugee Hearing strives to connect refugee claimants to the best people and information in the country to bridge the gaps and overcome the barriers inherent in the refugee determination system, in order for them to be as ready as possible for the refugee hearing. Kinbrace is a faith-based work in Vancouver which provides housing and support to 35 refugee claimants each year. It has been widely recognized for its work in developing a series of published resources under the title of Refugee Hearing Preparation Guide. The booklets appear in several languages and are now being distributed in major cities across Canada, where almost all inland refugees are located. There may not be complete unity in the church, but there is a strong sense of amity, and it will demonstrated again this Friday (February 24) as four theological colleges on the UBC campus – mainline, Catholic, evangelical and Baptist – join forces to examine issues related to the Reformation, a time, 500 years ago, of considerably less amity.
. . . examine a range of positions on the use of images in the worship, life and piety of the 16th century. [He] will explore the historical positions, and propose ways in which this Reformation debate may inform and enrich our deployment of the arts for faith and life in our own time. The event is presented by VST in partnership with Regent College. It takes place as part of Regent College’s 500 Years of the Reformation, a yearlong commemoration, featuring panels, courses and public lectures on the theme of the Reformation. The other day, Brandon Dorsey got in touch about some of the great music coming out of Westside Church these days. I hadn’t realized they had been so busy on that front. 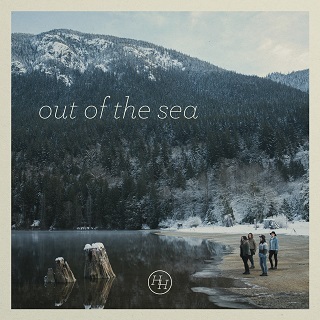 The ​latest release is​ the debut EP (released February 16), Out of the Sea, from a group of young women making indie folk/americana music under the name Heritage Hill. Listening to them, you could imagine yourself down at Jericho Beach at the Folk Festival – though the lyrics might be a little too R(Religious)-rated for the crowd. (They could make it on talent, though, and I hope they try.) Go here to listen to the songs. We’ve been blessed to have many gifted songwriters and musicians serving at our church. Over the past few years we’ve been working to write and produce quality music that we hope glorifies God and moves his people to worship. Westside will be hosting Backstage Bash! this Friday (February 24), which will be an evening of music, worship and missions, featuring Heritage Hill and another Westside band, Patriot Sail, all in aid of India Missions. To check out all Westside’s music – Heritage Hill, Patriot Sail, Westside Church, Westside Sings, All Tribes and Compilations – go here.